We help customers in finding the right solution to build competitive advantages and unique experience. Fast, flexible, and high quality cards capable of creating added value and leave a positive impression of your brand, are provided in 5 working days or 24 hours. We were born to be a leading company, focused on plastic cards and packaging solutions. Our expertise enables us to provide the best products for the following applications: loyalty campaigns, access control, member ship programs, promotional purposes, gifts cards, NFC and many others. technologies, materials, design, services and qualified support. Our lead time is 5 working days or express service in 24 hours. We are perfectly organized to handle any runs, starting from 100 cards. We ship in all Europe with overnight service. Orders delivered on time: 99%. 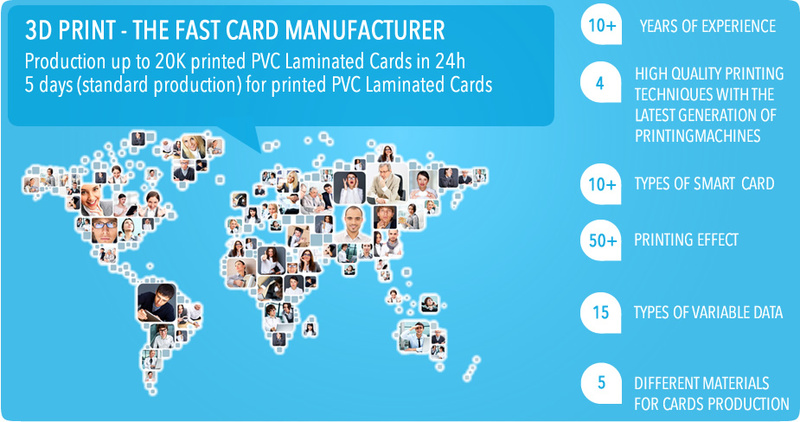 We have 15 years of experience in card manufacturing and packaging solutions, more than 1000 custumers in 15 di­fferent European countries. WE ARE HAPPY IF YOU ARE HAPPY. For us you are not just a number. Our customer service follows all your needs always with a human touch, professional skills and prompt support. Our sales team can help you in di­erent languages. We speak Italian, English, German, French, Spanish, Russian.